Owing to the difficulty of dealing with substances of high molecular weight we are still a long way from having determined the chemical characteristics and the constitution of proteins, which are regarded as the principal constituents of living organisms. – spoke this man on Dec 11, 1930. He received the Aronson Prize in 1926. He was awarded a Lasker Award in 1946 posthumously – many of us may not immediately recognise him, but are benefitted by him ! He also showed that the cause of poliomyelitis could be transmitted to monkeys by injecting into them material prepared by grinding up the spinal cords of children who had died from this disease, and, lacking in Vienna monkeys for further experiments, he went to the Pasteur Institute in Paris, where monkeys were available. His work there, together with that independently done by Flexner and Lewis, laid the foundations of our knowledge of the cause and immunology of poliomyelitis. For centuries, unanswered questions about the basic functions and pathologies of blood provided such a daunting obstacle for doctors and patients that in the 17th century, the still-dangerous practice of blood transfusions — used since at least the Middle Ages — was banned in large parts of Western Europe. The first fundamental discovery in the history of serology didn't come until 1901, when Karl Landsteiner's identification of blood groups spurred a flurry of additional research and discovery and eventually led to his receiving the 1930 Nobel Prize in Physiology or Medicine. After his research, it is now a well-documented fact that there are four main blood groups (types of blood): A, B, AB and O. Your blood group is determined by the genes you inherit from your parents. Each group can be either RhD positive or RhD negative.. .. .. and today is World Blood Donation day too. More than 100 million blood donations are collected globally every year. Giving blood is essential for healthcare resources – and more than 60 countries around the world rely on voluntary, unpaid donors who make up 100% of their blood supply. Every year on 14 June, countries around the world celebrate World Blood Donor Day (WBDD). The event, established in 2004, serves to raise awareness of the need for safe blood and blood products, and to thank blood donors for their voluntary, life-saving gifts of blood. World Blood Donor Day is one of eight official global public health campaigns marked by the World Health Organization (WHO). Your body carries around four to six litres of blood. Blood is made up of red blood cells, white blood cells and platelets in a liquid called plasma. Plasma is about 90% water, but also contains proteins, nutrients, hormones and waste products. Blood is made up of about 60% plasma and 40% blood cells. Each type of blood cell has a specific role to play. 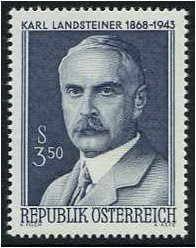 The man, Karl Landsteiner was born in Vienna on June 14, 1868. His father, Leopold Landsteiner, a doctor of law, was a well-known journalist and newspaper publisher, who died when Karl was six years old. Karl was brought up by his mother, Fanny Hess, to whom he was so devoted that a death mask of her hung on his wall until he died. After leaving school, Landsteiner studied medicine at the University of Vienna, graduating in 1891. Even while he was a student he had begun to do biochemical research and in 1891 he published a paper on the influence of diet on the composition of blood ash. To gain further knowledge of chemistry he spent the next five years in the laboratories of Hantzsch at Zurich, Emil Fischer at Wurzburg, and E. Bamberger at Munich. Returning to Vienna, Landsteiner resumed his medical studies at the Vienna General Hospital. In 1911 he became Professor of Pathological Anatomy in the University of Vienna, but without the corresponding salary. His suggestions, however, received little attention until, in 1909, he classified the bloods of human beings into the now well-known A, B, AB, and O groups and showed that transfusions between individuals of groups A or B do not result in the destruction of new blood cells and that this catastrophe occurs only when a person is transfused with the blood of a person belonging to a different group. To the end of his life, Landsteiner continued to investigate blood groups and the chemistry of antigens, antibodies and other immunological factors that occur in the blood. It was one of his great merits that he introduced chemistry into the service of serology. In 1939 he became Emeritus Professor at the Rockefeller Institute, but continued to work as energetically as before, keeping eagerly in touch with the progress of science. It is characteristic of him that he died pipette in hand. On June 24, 1943, he had a heart attack in his laboratory and died two days later in the hospital of the Institute in which he had done such distinguished work. The first successful blood transfusion occurred in 1907 as a direct result of his work, which led to advances in medicine, therapies, and surgery. Landsteiner is also credited with laying the groundwork, together with fellow scientist Erwin Popper, that led to the discovery of the polio virus. This was the first step towards developing a treatment for the disease which affected millions of children worldwide. The Nobel Prize in Physiology or Medicine 1930 was awarded to Karl Landsteiner "for his discovery of human blood groups". The Aronson Prize is a prize awarded for achievements in microbiology and immunology. It was established by the will of the pediatrician and bacteriologist Hans Aronson and has been awarded since 1921. Aronson bequeathed a large part of his estate to the establishment of the prize. The prize is awarded biannually on 8 March, the date of Aronson's death. In 1969, the foundation that awarded the prize was dissolved on the initiative of its last chairman Georg Henneberg, and the responsibility for the prize and the remaining capital was transferred to the (West) Berlin government, in order to safeguard the existence of the prize. Since 1970, the prize has been awarded by the Senate of Berlin. On what would be his 148th birthday, we thank you, Karl Landsteiner, for helping us lead longer, healthier lives.